Plum has lots of favourite things: catching sticks, her bear, her bed – but really LOVE is her absolute favourite thing. She loves her family, and they love her. But trouble loves Plum too; sometimes she just can’t help doing slightly naughty things. Will everyone still love Plum then? An exuberant celebration of love, mischief and a very childlike joie-de-vivre. Emma Chichester Clark began the website Plumdog Blog in 2012, chronicling the real-life adventures of her lovable “whoosell” (whippet, Jack Russell and poodle cross), Plum. Emma soon gained thousands of loyal Plumdog devotees, and in 2014 a book of the blog was published by Jonathan Cape. 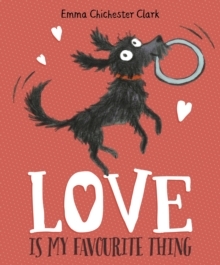 This picture book story is the first Plumdog book for children.